Who doesn't love the smell of french vanilla? 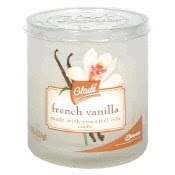 When I want to relax in my bed or in my tub, I light the Glade french vanilla candle. The candle creates a lovely aroma and it lasts a long time. It is also made with natural oils. The best part is that the candle only costs a few dollars, and you can purchase it virtually anywhere. There is no need to spend a lot of money on another candle when this one is too perfect. It also looks good in your home, and the wrapper can be easily taken off. No I have not. I just posted the recipe because it was something I was going to try and I was going to post a review about it later. Then see if whoever tried it will like it. My mom has a candle by glade and I love the smell of it. I think its called angel whispers? Anyways it has the sweetest scent! Cool, I am looking forward to that review Tori. And yes! They do have a great scent!